Fittingly written whilst out on my postal round today, in a moment of literary clarity. Thomas C. Wilson, sometimes T.C. 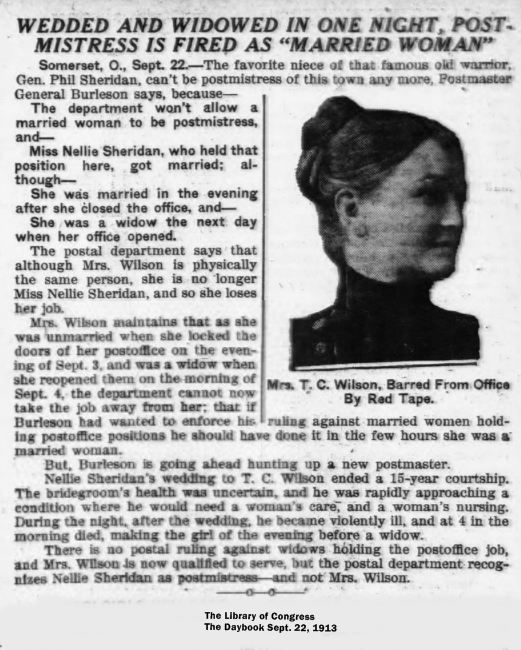 Wilson, was the man who loved Nellie Sheridan enough to wait fifteen years before marrying her so that she could keep her position as postmistress. Although clearly deeply in love, the couple didn’t always share the same points of view, religion, or culture, but theirs was truly a relationship based on mutual admiration and respect. 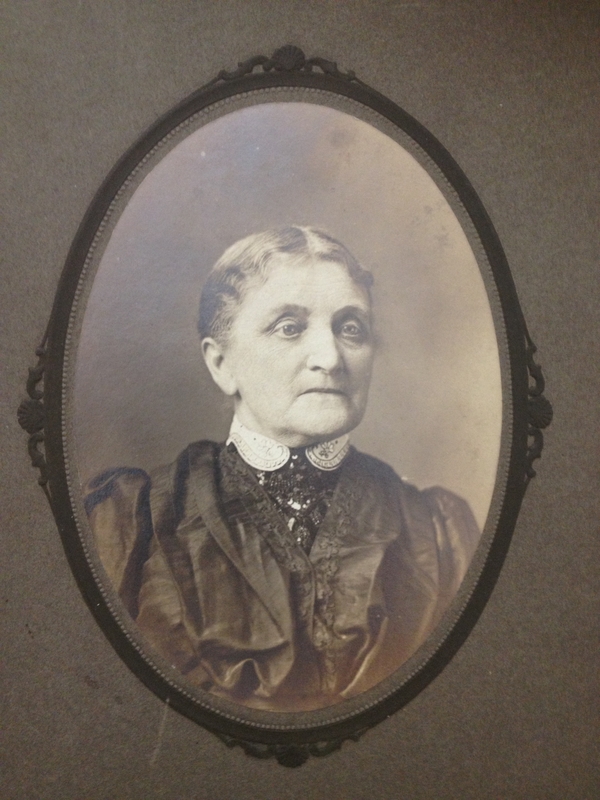 Martha Wilson, wife of Judge James Wilson, one of the earliest settlers, was born in Alleghany county, Maryland, Feb. 1786, and died March, 1880, in the ninety-fifth year of her age, and was the last of the pioneer women in Clayton township to pass from time to eternity. She came to the neighborhood where she lived and died, in 1811, when neighbors were few and far between. Bears, wolves and panthers, were frequently seen. 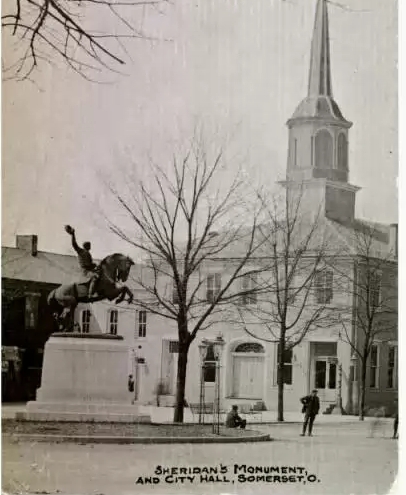 Once, during the war of 1812, when her husband was absent at Zanesville, there was an alarm that the Indians were coming across the country and murdering the white people. Many families loaded up and fled. Mrs.Wilson having no way to go and take her three children, converted her cabin into a fortress and prepared for battle. She barricaded the door with timbers, prepared her gun and ammunition, and with the great dog at her side, stood with gun in hand all through the night and until dawn of day ; but no Indians came. On another occasion when her husband was away from home, the wolves attacked her only sheep, before she had put it in the pen for the night. She heard her faithful dog fighting and striving to drive the wolves away ; but they were ravenous and would not be driven off by the dog. Mrs. Wilson lighted a torch, rushed out, frightened away the wolves, and rescued the sheep. The savage animals remained so near that she could distinctly hear their teeth gnash and grind together as they thus gave vent to their unavailing rage. For many years previous to her death she had been blind, but she was cheerful, resigned and happy. Most of the time during her later years, she fancied and believed that she was living with her husband and children who had long been dead. Again she would recognize and converse intelligently with her living sons and daughters at her bedside. Mrs. Wilson was a religious woman ; she united with the Methodist Episcopal church in 1809, at her old home in the State of Maryland. The Methodists held camp meeting for a number of years in a grove upon her husband's farm, and a church (Wesley Chapel) was subsequently erected near the old camp ground. His great-grandfather, and namesake, was Thomas Wilson II, who had fought in the American Revolution. Thomas was enlisted with the 4th Company, Frederick Detachment, 4th Battalion,Maryland Troops, 5/2/1782, under Capt. George Richard Byrd. He is interned at Wilson Cemetery at Altamont, Maryland. James Wilson, son of Thomas II, was born March 6, 1781. He married Martha Ashby and migrated at an early date to Washington Court House,Ohio. Like Nellie, Thomas also would have also known the stories of his brave ancestor. It is without a doubt that the two would have shared a common interest in perpetuating such rich and meaningful history. 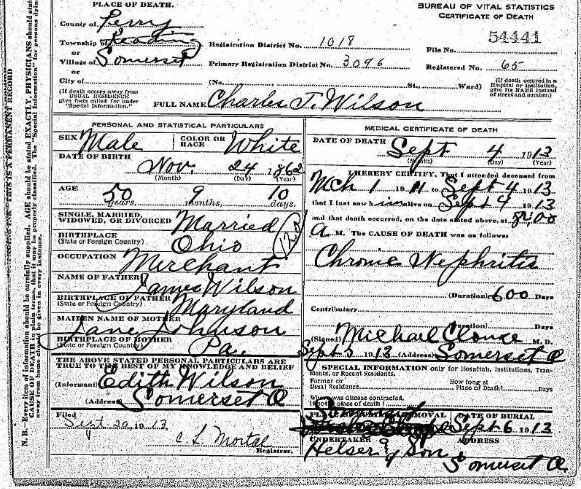 Thomas Charles Wilson, son of James Riley Wilson and Jane S. Johnson Wilson, was born 24 Nov. 1862 in Perry County, Ohio. He was one of eight children born to the couple. 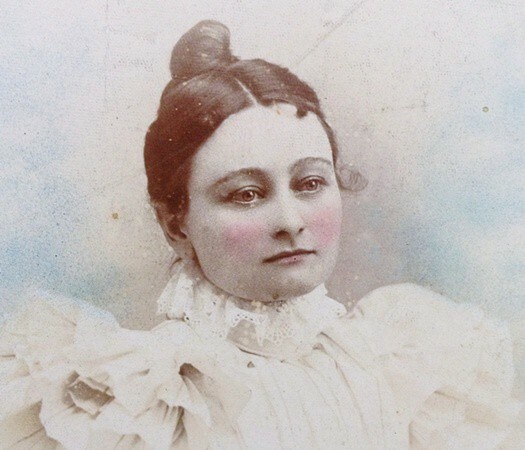 His siblings were as follows: James William Wilson, born December 18, 1859; died November 11, 1930.Mary Aurilla Wilson, born September 12, 1843; died March 27, 1885, Harriet E. Wilson, born October 19, 1845; died August 24, 1854, Edith Jane Wilson, born April 20, 1848, Sarah Katherine Wilson, born January 20, 1851; died July 06, 1926, Aaron Johnson Wilson, born July 23, 1854, Martha Rachel Wilson, born March 22, 1857; died October 31, 1931, and James William Wilson, born December 18, 1859; died November 11, 1930. James Wilson’s usual form of work was that of a farmer. 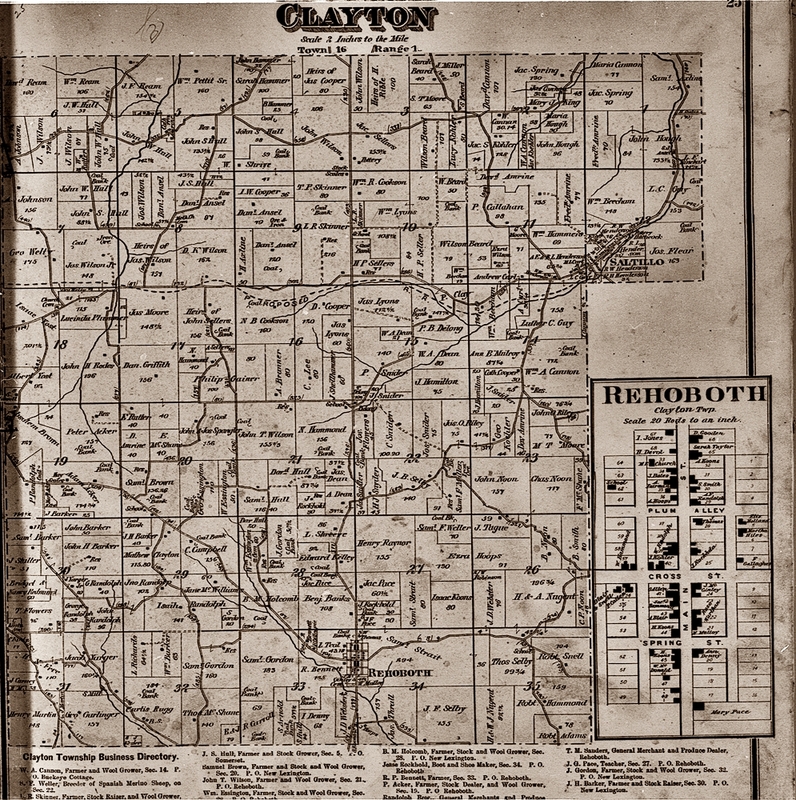 He had a large farm in Clayton, Twp., Perry County, Ohio. In order to provide a bit of historic insight as to what the Wilson nineteenth century farm was like, please note the following information. 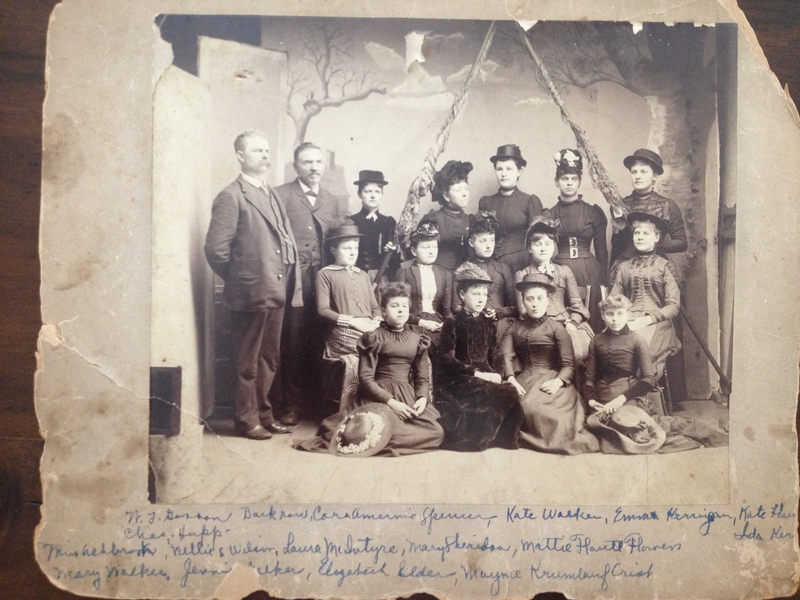 In 1880, James Wilson’s farm included six milk cows, seven “other” cows (possibly oxen), five calves born on the property, fifty hens, eighty-one sheep, and twelve swine. His farm produced eighteen acres of Indian corn, four acres of oats, fifteen acres of wheat, an acre of potatoes, and 3 acres of apples. In the year previous, he had produced seventy pounds of honey and three hundred pounds of butter. After the death of his father, James, T.C. resided in Somerset with his sister, Edith, who never married, and his aging mother, who had returned from residing in Iowa circa 1910. Per the 1910 census, his mother was 88 years old and his sister was 61. 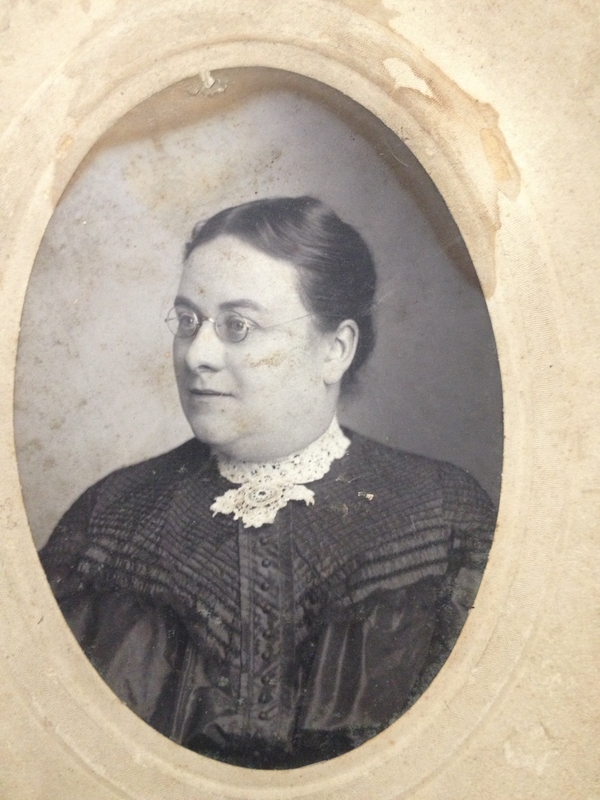 The Wilsons employed a servant girl by the name of Mary Souslin, who also lived in with them. She was 31 years old. Thomas was a merchant in a business called Johnson and Wilson. It specialized in clothing. Thomas Wilson died on his wedding night in 1913. 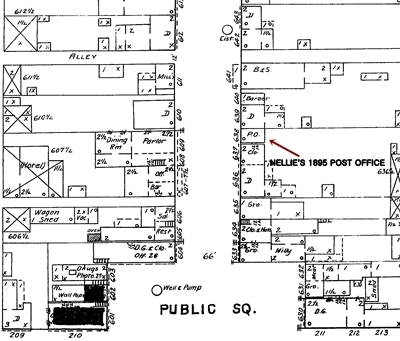 Nellie purchased a burial plot in the Somerset Methodist Cemetery for him. His mother outlived him by four years and died in 1917.